Having spent a lot of time in China in my life, I hardly ever think of it as a Bizarro-World where people walk around upside down, read back to front, and eat inside-out. 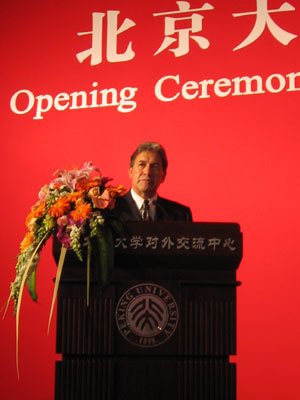 Then I saw Winston Peters speaking at Peking University in praise of all things Asian. 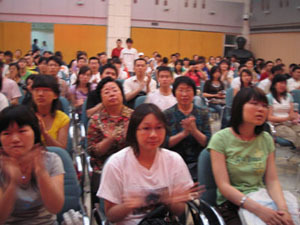 Here's a photo I took at the opening ceremony of the New Zealand Centre, Peking U. ...And running with the theme of confusing imagery, another one I turned around to take: a hallful of Chinese students and academics applauding Winston Peters. During his speech, the Minister kindly refrained from proposing common ancestral links, but gave mad props to Chinese international students, Academics, and Politicians (but not journalists). Manying and Pansy, that means you. He thinks you guys are awesome! In a further brief episode of hip-hop surrealism, the President of Peking University acknowledged the dignitaries present (the standard roll call at the beginning of such speeches) by simply adding the word 'respect' in front of their names. "Respect, Winston Peters!" The MC coudn't pronounce any of the English names properly. 'Winston' was fine, but he became Mr "Pedderers." That's satisfying enough, for now.